Merry Christmas, Precious! Our present for it is we sings a song! I hope you got what you wanted for Christmas, Smeagol. We didn't :( but Shena is nice to comment. We are very happy to see him, yes we are precious! Our friend Andy Serkis tells us it is very good, but we shall see. 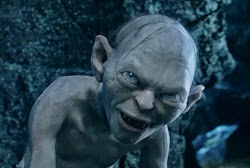 Hello, Gollum, my precious! I have brought you a tag for the Sisterhood of the World Bloggers Award! (I am aware you are not a sister of the world, but Gollums are also allowed in the club). If you want to do the tag, the questions are on my blog: loveroflembas.blogspot.com. Precious is allowed? That is very nice, precious. Perhaps it is nice, even if it's name is about elf bread.